The Glad Cafe is a blink-and-you’ll-miss-it type of place, located through an unassuming entrance on Pollokshaws Road in Glasgow’s south-side. We’re rather ashamed to say that, until recently, we had never actually been inside the cafe despite consistently hearing great things about not only their food, but their aim and what they stand for. The cafe is more than just a cafe – it’s also an art space and a venue and is described as ‘a social enterprise with the legal structure of Community Interest Company‘ on their website, which goes on to say: ‘As a social enterprise we have a social purpose to eventually plough profits, (once loans have been repaid), into affordable music lessons for local people’. Recently, Buddy’s BBQ announced that; not only would they be opening a brand new restaurant this Summer in the south-side of Glasgow, but they would also be running a special pop-up event inside the Glad Cafe. Tickets were limited and sold out within minutes of going on sale – a indicator of the level of demand for Buddy’s grub and a sign that similar events are sure to follow in the future. The event took place inside the venue area of the Glad Cafe, accessed through a set of double doors beyond the cafe. 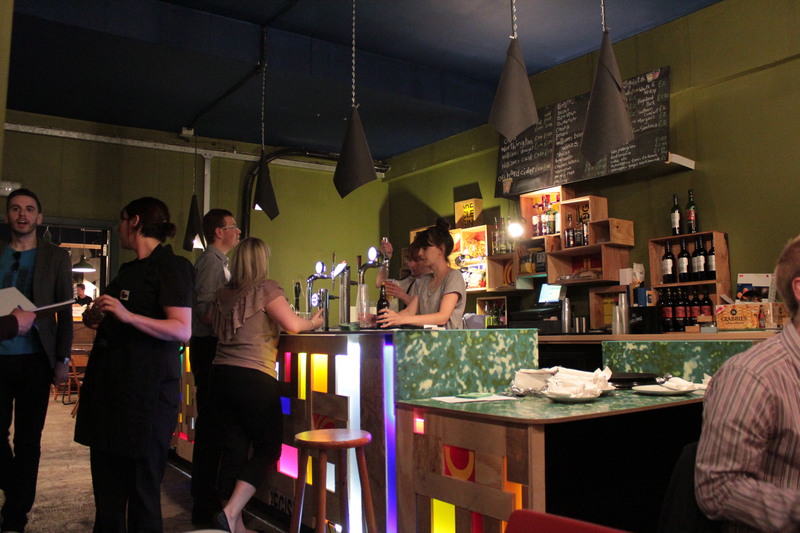 The bar inside the venue area of the cafe. The menu consisted of several starters, main courses and one dessert. After our starters, we were informed that the dessert on the menu (deep-fried cheesecake) wouldn’t be available due to an issue with the fryer and that it had been replaced by a cornbread cheesecake with a strawberry compote. Deep-fried cheesecake did sound delicious; however, a cornbread cheesecake sounded like a good substitute! The dishes ranged from £4 to £6. Tickets to the event were priced at £5 each in order to secure your place, but this amount was deducted from the food bill at the end of the evening. We started off with the BBQ pulled pork nachos and fried okra. 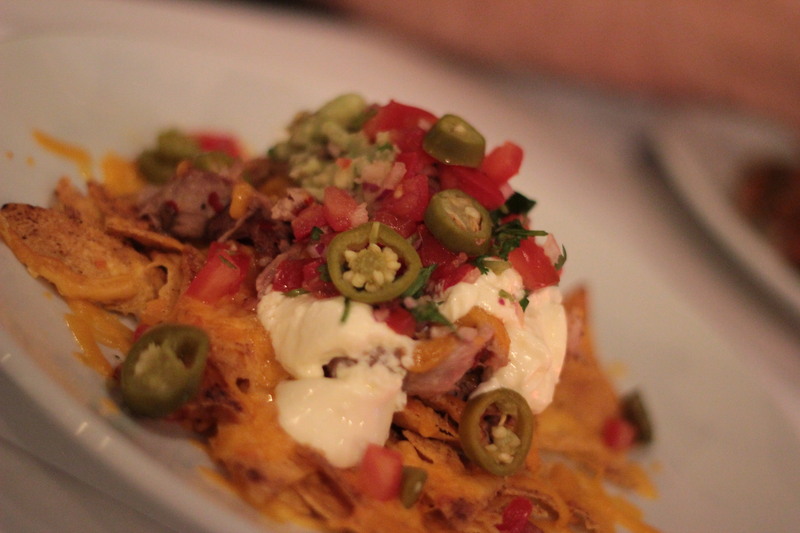 For a starter, the portion of nachos resembled a main meal (not that we were complaining!) and were simply delicious. The nachos were topped with pulled pork, sour cream, salsa, guacamole and jalapeños and immediately, our first thought was that they’d be a perfect starter or sharing plate for Buddy’s new restaurant. The nachos were crispy, there was just enough cheese and the pulled pork was tender and full of flavour. Despite the major influx of pulled pork in the Glasgow dining scene, Buddy’s still remains some of the absolute best out there. The fried okra, thankfully was nice and crunchy. 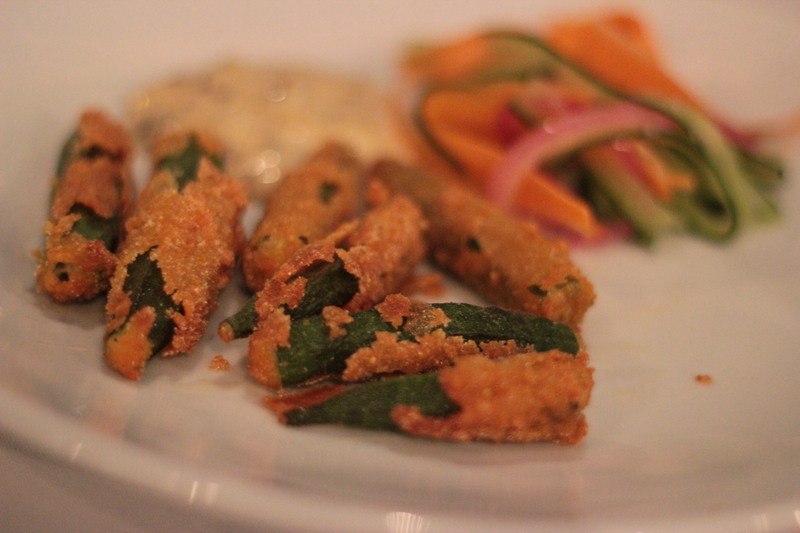 I’ve had okra in the past, mainly during my time in the US and when it’s done right, it should be crunchy like this. It can; however, end up being very dry and rubbery. Thankfully, Buddy’s okra was not. The homemade chipotle mayo that it was served with was fantastic too. I would have happily eaten another tub of it if I could have. Some of the batter had fallen off of the okra when it was brought out, but I’m guessing this was more to do with the fryer issues than anything else (which happened after we got our starters). It was still very tasty and another item I’d like to see on Buddy’s restaurant menu, when the place opens in the summer. 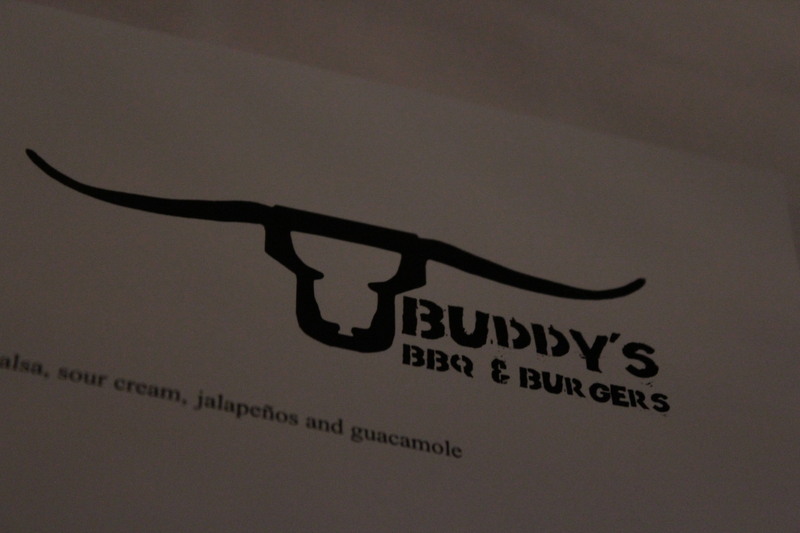 Our first main course was the Buddy’s sliders. Two mini patties each topped with caramelised onions, chilli jam and cheese on a bun with salad. If you’ve had a burger from Buddy’s then you’ll have an idea of what these were like. 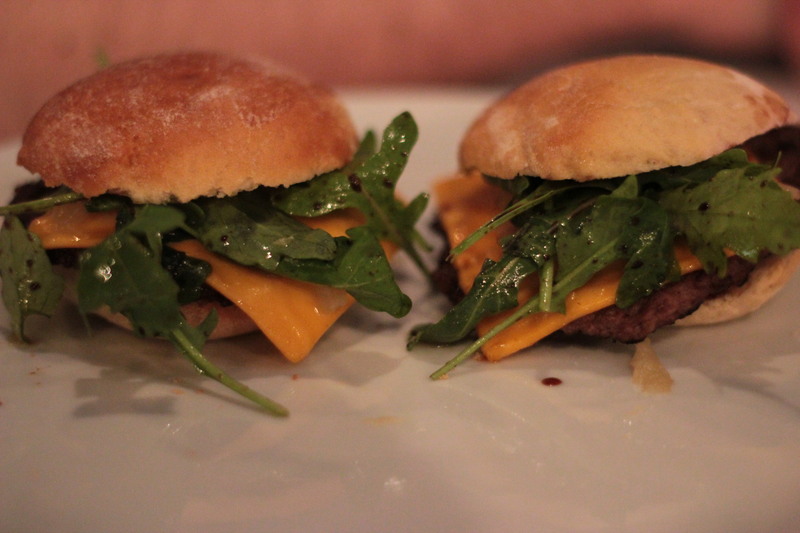 The mini smashed patties weren’t too heavy and the chilli jam was both sweet and slightly spicy, without being too hot. Overall, the sliders were great; although, I wasn’t too keen on the salad dressing which was quite oily and I was still able to feel it lining the inside of my mouth after I was finished. Other than that, the burger itself and the rest of the toppings were very good indeed. 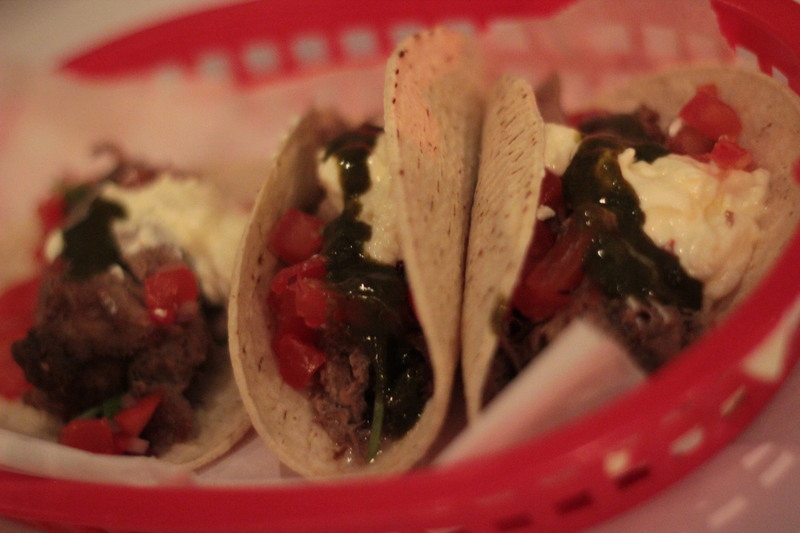 Our second main was the Tacos De Lengua – slow cooked ox tongue on soft white tacos with sour cream, guacamole and salsa. Simply put, these were outstanding and our choice for dish of the evening. The meat was tender and fell apart with each bite and we pretty much inhaled all three tacos that came in the basket. They were way too easy to heat/scoff down our throats. Having ox tongue on a taco was different and we like the idea of Buddy’s experimenting with these types of unusual food combos. How about a cheeseburger taco in the future? Finally, we ended on the cornbread cheesecake. If you’ve read past reviews, you’ll know that we’re huge fans of cornbread. If you’re ever in New York, head to the Great Jones Cafe for brunch and try their eggs jambalaya which is served with warm cornbread and a Bloody Mary – delicious. Considering that this was a last-minute back up dessert due to the fryer issues, it was certainly a home run! Again, the cornbread base was unusual and despite not being presented like a traditional cheesecake, it tasted great and wasn’t too heavy either. The cornbread base was slightly warm and soft, with a slightly golden, crunchy side which we really liked. 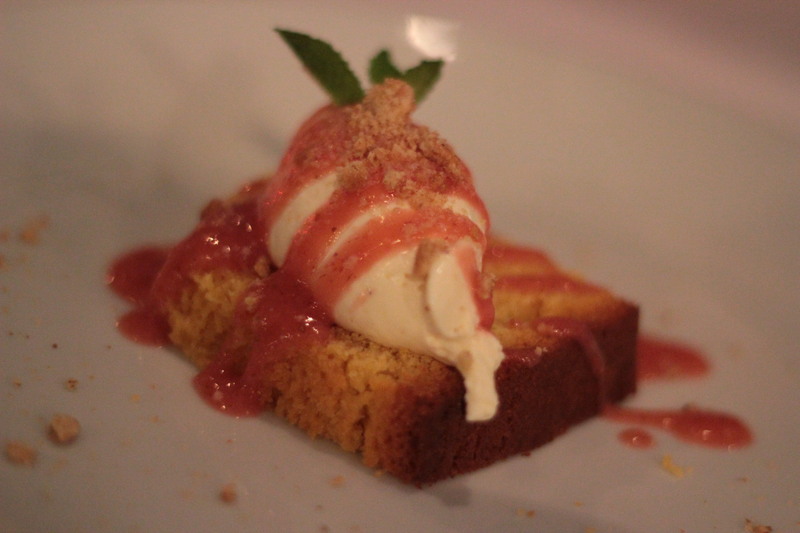 The vanilla cream cheese worked well with the strawberry compote and helped create what was a very good summer dessert. Overall, Buddy’s first pop up event was a success. The menu was well priced and there was a good range of dishes on offer. From the outstanding tacos to the filling pulled pork nachos, there was lots on offer without the menu being too crowded. 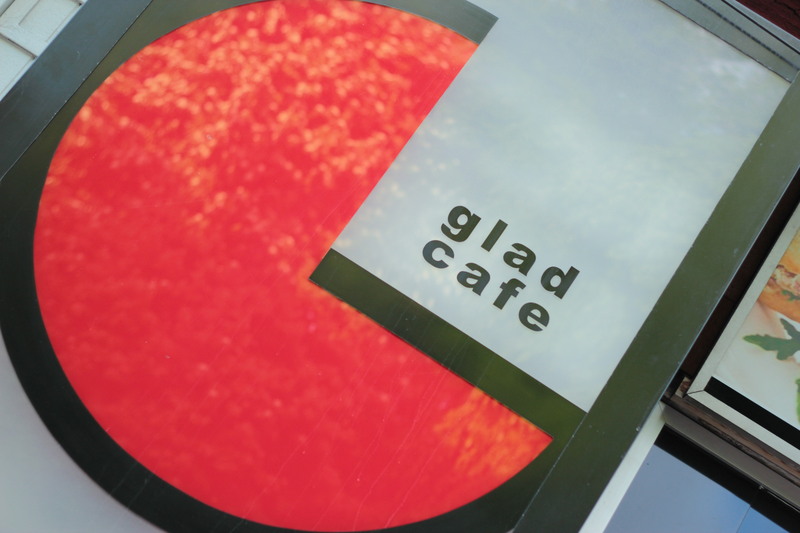 The Glad Cafe was a great choice of venue and we’d like to see them set up there again, or indeed for more events of a similar nature held there. 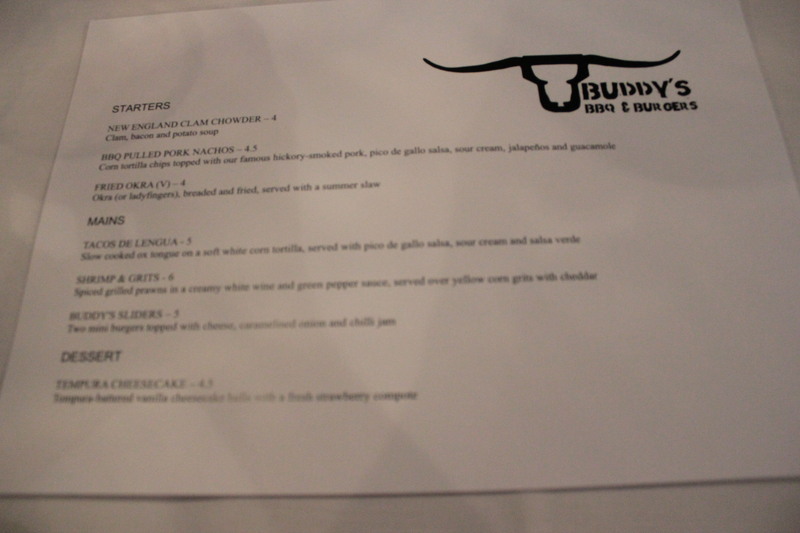 There was a diverse range of food served up at the first ever Buddy’s pop-up and despite a couple of minor niggles, it was all very good. What left us feeling very excited was that it was likely a sneak peak of what we can expect to see when Buddy’s BBQ Diner opens its doors this summer and if so, then we’ve got lots to look forward to. Price: £5 entry, which was then deducted from total food bill. Dishes £4 – £6. + Good range of dishes. + For a starter, the portion size of the nachos was huge. – Salad on the sliders was a bit too oily due to the amount of dressing.